Provide appropriate alternatives: Scratching posts are available at most pet stores. You can sprinkle catnip on the post to enhance its appeal, or provide treats to reinforce good behavior for using the post. Avoid punishment: Never spank your cat or yell at it for inappropriate scratching behavior. If your cat scratches on furniture, just say “no,” and bring the cat to the scratching post. When your cat is scratching on furniture, you can also try spraying him or her with a water bottle, as long as the cat doesn’t realize you are controlling the water. Try nail covers: Soft vinyl caps (available at pet stores) are glued to the tip of each nail every 6 to 8 weeks to blunt the effects of scratching. Yes. The technique varies depending on the preference of the veterinarian. There are two traditional surgical techniques, which involve using either a scalpel or a clipper to remove the claw. A third surgical technique uses a laser to remove the claw. With this procedure, there is relatively little bleeding, and some cats (especially young cats that are not overweight) have less postoperative pain. Laser declawing tends to be more expensive than other techniques, and not every veterinarian has the equipment to perform this procedure. 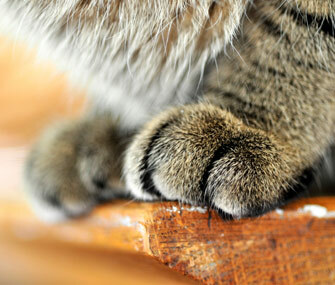 A final technique, called a tendonectomy, does not remove the claws, but instead cuts the tendons on the underside of the paw. With this procedure, the claws remain retracted in the paw, so they generally can’t cause harm as long as they are trimmed on a regular basis.